The telegraph reached Yakutia. And radio. So news of the war and of the revolution reached them. During the First World War, when British anthropologist Maria Czaplicka, was in the west of Yakutia in 19l6 (her visit to Siberia came after she had written a book on its people! but there were of course other reasons why the British government funded experts for trips to Russia at this time) she found the Tungus she met very enthusiastic about the use of aeroplanes for transport. Air transport did make a tremendous difference to the life of the people in north-East Siberia. By chance civil aviation was beginning at the same time as the Soviet Union was being established, so the USSR started with a state airline, Aeroflot, famous for its catering which was always chicken bones whatever the time of the flight, even one in the morning, and no alcohol for the passengers. The Permanent Council on Civil Aviation was set up on 9th February 1923. At this time Yakutia was as big as European Russia, but with only 275,000 inhabitants. Planes linked places which had previously been totally inaccessible for most of the year. The Russian defeat in the Russo-Japanese War of 1904-1905, showed the urgent need for Russia to open up the northern sea route. The world's first icebreaker "The Yermak" was built by British shipyards in Newcastle in 1898. From 1910 to 1915, the Arctic Ocean Hydrographic Expedition in two icebreaking survey ships, the Taymyr and the Vaygad, surveyed the sea route between Arkhangelsk and Vladivostok. The expedition leader Boris Vilkitsky emigrated to London after the revolution. One of the commanders, Aleksander Kolchak, led the right-wing, white forces in Siberia in opposition of the Bolsheviks, being finally captured and executed in 1920. This survey enabled the Russians to lay claim to the coastal land and islands off the coast including those newly discovered during the survey. The first flight in an aeroplane over the Arctic ocean was made in August 1914.The world's first permanent Arctic radio station was set up on Dickson Island on 25th August 1915. In 1920, the Northern Sea route committee was set up by the new government to turn the Northern sea route into a practical communications artery. In 1932, this was replaced by Glavsevmorput. At its head, Otto Schmidt, the senior editor of the Great Soviet Encyclopaedia. Glavsevmorput was in control of all the economic development in Siberia north of 62 degrees as well as the sea route. it took over the other Arctic enterprises such as Artikugol (coal), the Reindeer-Breeding Trust, the Taimyr Trust (for development in the Taimyr) and the Arctic Islands. Its central office was divided into separate departments. It also controlled fishing, mining, whaling etc. It used forced prison slave labour to build towns like Tiksi on the Arctic coast, and also instead of skilled labour in the mines. Even the new icebreaking steam ships had problems navigating the North-East passage in time to deliver cargoes before the ice was impassable. In 1937, twenty six ships got stuck in the ice all winter, including seven of the eight icebreakers. This was an economic disaster for the precarious industries of the far north. In 1939, Otto Schmidt resigned and retreated back into the academic world. He became Director of the Academy of Science's new Institute of Theoretical Geophysics. Glavsevmorput had been greadually reduced in size and responsibilities, so that by 1953, was remained was the Arctic Shipping Division of the Ministry of the Merchant fleet. In 1957, the ships were divided into two shipping companies - the Murmansk Shipping Company and the Far Eastern Shipping company which as based at Vladivostok. In 1959, the world's first nuclear powered ice-breaker - the "Lenin" was launched. Another nuclear ice-breaker, the Arktik was the first surface vessel to finally reach the North Pole. 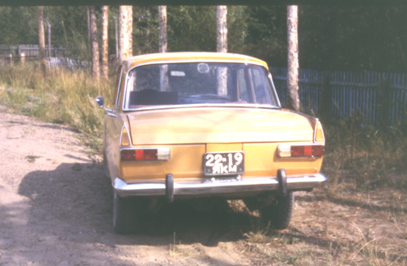 In 1987, the Sibir, also reached the North Pole. In 1960, the Ministry of Civil Aviation was put in charge of all Arctic aviation, and the polar stations came under the council of Ministers. In 1964, Glavsevmorput was finished. In 1970, a new department of Merchant Marine called the Administration of the Northern Sea Route, was set up and in 1991, this was turned into a department of the Ministry of Transport of the Russian Federation. A new stage in communications was reached in the 1970s with the Molniya communication satellites which were in special elliptical orbits, as the usual geostationary orbits above the Earth's equator could not reach that far north. This meant access to television for everyone, and was to have an impact on the changes that ended the USSR. The end of the Soviet Union, brought new commercial airlines but also chaos with a shortage of fuel, cancelled flights, and lax safety precautions. Yakutia has been effectively isolated from other countries outside the Soviet Union. Until 1989 foreign tourists were forbidden to go there. The first tours open to foreign visitors, cruises on the Lena were very expensive, limited in numbers and in advertising. Also the tourist being on a boat in the middle of the river for most of the time saw little of the country. Roads are appalling. Because of the permafrost they are made of gravel or ashphalt. Concrete roads such as those in Yakutsk break up. Even major highways are nothing more than very bumpy tracks. Car suspensions are very high. In most towns and villages there is just mud for streets, with bits of bones of cows or reindeer sticking out and (fortunately) friendly fluffy laika dogs all over the place. Planks are placed over the above ground service pipes for water etc. and these are lagged. 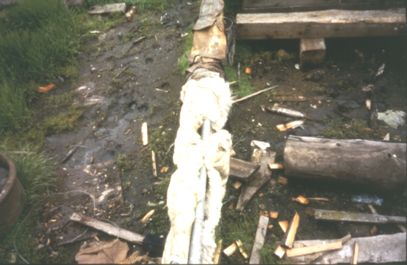 The picture shows pipes at Kyusyur lagged with bits of reindeer skin. The Trans-Siberian railway was originally scheduled to go from Irkutsk to Yakutsk and then to Okhotsk on the Pacific coast. However the new threat from Japan which had ended its isolation in the 1850s - resulted in a continuation of the railway to the far east - although a connection across Lake Bailkal was still not in place at the time of the Russian-Japanese War early in the 20th century. A branch from the Trans-Siberian led towards the Aldan goldfields, but its progress further north to Yakutsk has been very slow. When news of the Revolution reached Yakutsk, a Committee of Public safety was organized with representatives of different groups. The Russian vice-governor was forced to recognize its authority. Most of the members were SR Socialists, Mensheviks or Yakut Nationalists. the Chairman was G.I.Petrovskiy, a Bolshevik, who had been one of the political exiles in Yakutia. there were more than 500 political exiles living in Yakutia in 1917. After the amnesty in March 1917, they all moved to Yakutsk, which although the capital of an area the size of western Europe, still had only 8,000 inhabitants, most of them Yakut. Trade Unions and Soviets were formed. The Bolsheviks did not get majority support in Yakutsk as most the people who were at all political minded there, preferred the SR Socialists. The Bolshevik politicians in Yakutsk, Petrovsky, Orjonikidze, Yaraslavskiy and Kirsanova left for Petrograd (the new name for St.Petersburg) at the end of May 1917. In August 1917, the Yakutsk committee of Public safety reorganized with the Bolsheviks but with the SR Socialists and Yakut Federalists, the Nationalists - the "Sakha Aimakh" (Yakut Kindred), the Yakutsk City Council and the Council of Military Deputies.It was the "United Democracy". They refused to recognize Lenin's new Bolshevik government and created an anti-Bolshevik "Committee to Safeguard the Revolution". In November 1917, The Bolshevik government under Lenin published the Declaration of the Rights of the Peoples of Russia, which proclaimed the equality and sovereignty of all nationalities, the abolition of national and religious descrimination, and the right of every nation to free self-determination - including secession from Russia. These nominal rights were incorporated into the constitution of the USSR. This terminated the regime which had existed since Speransky's Regulations of 1822, abolished yasak, and the supervision of the life of native communities by the Russian police. In 1920, the debts to traders which had caused so much poverty and slavery were all cancelled. In February 1918, the government of Yakutia proclaimed the independence of Yakutia from the Russian Republic. Bolsheviks retaliated by organising and encouraging strikes in Yakutsk, small ones, then a three week stoppage in March to April 1918. The 50 strong Yakut Soviet claimed to seize power, but only succeeded in overthrowing the independent Yakutian government, after Russian troops were sent from Irkutsk. On the 1st July 1918, the Bolsheviks took over Yakutsk. The nationalist opposition were imprisoned, the zemstvo organizations were abolished, soviets were set up, and taxes imposed for fund raising. But they had only been in power for ten days, when Irkutsk was taken over by the Czechs. The Yakutsk Soviet was forced to surrender on 5th August 1918. The White Russian government sent many of those involved in the Soviet to prison in Irkutsk and executed 24 of them. In Yakutia, the zemstvos were reinstated and Socialist Revolutionary V.N.Solovyov returned as Provincial Commissar of the Siberian Provisional Government. The Civil War in Siberia with intervention by the British, Czechs, Japanese, etc. lasted from 1918 to 1925. The Cossacks joined the Whites in opposition to the Bolsheviks and Socialists as they were the main property owners in Siberia. In December 1919, the Bolsheviks gained power again in Yakutsk and installed a Soviet executive committee. Thirteen anti-Bolshevik leaders were sentenced to death by firing squad. The victims included Solovyov and the Mayor of Yakutsk. Produce for the wars was requisitioned from angry and resistant peasants. By the end of January 1920, the Bolsheviks had suppressed their opposition but not for long. It was not under the end of the year that they finally terminated the Sakha Aimakh organization. Meanwhile the Whites had invaded Yakutia, and anti-Soviet forces were regrouping to include nationalists. In March 1921, the SR leader of Okhotsk coast Regional government rebelled against Bolshevik representation of the Far Eastern Republic. His army was reinforced by a White Cossack detachment under Bochkaryov arriving by sea from Vladivostok. They were joined by men opposed to the Soviet rule in Yakutia, including SR politician P.Kulikovskiy, Tatar merchant, Yusup Galibarov, and the provincial Commander of the Red Army Tolstoukhov (who had changed his mind). The Yakut Nationalist leaders wanted to combine with part of Eastern Siberia to form a separate state under the protection of the Japanese - who supported this idea. In August 1921, a "Yakut Insurgent Movement" established headquarters at Nelkan and with an army of about 200 men including local Tungus and assisted by Bochkaryov's White Cossacks, launched an attack against the Bolsheviks. They advanced into Yakutia. In September 1921, a coalition of Yakut Nationalists, K.D.s and S.R.s overcame the Soviets in Northern Yakutia and besieged Yakutsk. From Irkutsk, the former SR anarchist leader, Nestor Kalandarashvili, a Georgian, led a Soviet army from Irkutsk to Yakutsk. He was killed, but his army was successful in driving the opposition back east to the Okhotsk coast. The White forces trapped by the sea, were sent support from Vladivostok. In February 1922, the Yakut Autonomous Soviet Socialist Republic was founded. But its constitution was not drawn up until 1926, and not ratified until 1936, because Moscow found the Republic too Yakut in character. As it was so large it created its own Committee For Aid to the Peoples of the Outlying Regions of the North. This was to establish grain stores, distribute cattle, reindeer, guns, etc. to those in need, and organize the first cooperatives. The extension of medical services and schools - (in 1917, there had been 173 schools). The Western European Latin alphabet - as recently introduced in Turkey - since the language was related to Sakha (Yakut) was established by teachers and publishers, to replace the earlier - pre-Revolution, version of Cyrillic for the Yakut language and for Yakut education in schools. This showed the local unwillingness to be dominated by Russian culture. The Sakha language was used in all the schools where the Yakut population dominated, as the main language and everywhere else in Yakutia was used equally with Russian. A society was founded as the successor to the Sakha Aimakh. It was called the Sakha Omuk (The Yakut People) and published a journal called "Cholbon" ("Morning Star" - Cholbon is Sakha name for the planet Venus). The stories and poetry, reflected Yakut nationalistic interests and were often anti-Soviet. The poem by A. Kulakovskiy "The Shaman's Dream" describes Russian immigrants as bringers of doom and slavery to the Yakuts. An anti-Soviet story by Altan Saryn "One Who Recalls the Past" is in favour of the Pan-Turkic movement and said the Yakut language should be purified by removing all the Russian borrowing and replacing them with Turkic equivalents. The Russians were unable to infiltrate Sakha Omuk. Yakut Bolsheviks included M. K. Ammosov, the First Secretary of the Yakut Communist Party, S. M. Arzhakov, I. N. Barakhov, and Platon Oyunskiy the poet, writer, and first President of the Yakut ASSR. The most important source of economic wealth in Yakutia at this time, was gold. The Lena Goldfield at Bodailbo was within the boundary of Yakutsk province before 1917. But in 1922, the border of the Yakut ASSR was moved to the east so the goldfields were placed within the Russian Republic. This meant that while Russia benefitted from the gold, Yakutia still placed had the demands on its economy for labour, for grain, meat, butter, fish, hay and horses. This caused unstable market conditions as it drained economic resources, with no return. Yakutia was also hampered in trading with other parts of the Soviet Union, by the high cost of transport which added 149 per cent to the cost of flour and 267 per cent to the cost of kerosene. Kerosene was at that time essential for lighting and heating. In 1922, the "Yakut Insurgent Movement" formed "a Provisional Yakut Provincial People's Administration" at Churapcha. Troops belonging to the Yakut Insurgent Movement, occupied Verkhoyansk and Sredne Kolymsk and advanced up the Lena and the Viluy. But the most important places in Yakutia, including Yakutsk, were defended by mixed Bolshevik forces, including Russians, Yakuts and many other nationalities. The Soviet army had reoccupied central Yakutia, and the Nationalist and White Russian army was driven back to the Okhotsk coast. Bochkaryov's men controlled the northern part of the Okhotsk coast and Gizhiga. They survived by killing the reindeer of the Evens and Koryaks. In September 1922, the White forces were reinforced by 700 men, mainly officers brought by sea from Vladivostok, and landed at Ayan. These formed the core of the "Siberian Volunteer Militia" to which was added several hundred Yakuts and Tungus, all under General A.N.Pepelyayev. From Ayan they advanced through the Jugjur mountains driving the Bolsheviks back to the River Amga. Red Army units were sent out from Irkutsk, down the Lena. On the 22nd October 1922, the Japanese soldiers were withdrawn from Vladivostok, and the Red Army moved in. The Japanese retained occupation only in half of Sakhalin. Thousands of White Russians fled into Manchuria and in 1925 they formed a Russian Organization there. In April 1923, the Bolsheviks sent a force from Vladivostok to clear out remaining White forces. Some still managed to survive and bands of White soldiers, surviving by rustling reindeer from native herds, and continue to attack any representatives of the Soviet government. In the Autumn of 1923, a further Soviet expedition landed at Kolyma to crush the last of the resistance to Soviet rule. In 1923 A new goldfield was found on the Aldan. This led to a goldrush. Russians formed 58 per cent of the work force, Chinese and Koreans 33.5 per cent and Yakuts only 3.2 per cent. At Nelkan, Yakut Nationalists led by M.K.Artemyev and Y.Galibarov got the support of the local Tungus for a campaign which gained gained control of the Okhotsk coast and penetrated north along the Indigirka to the Arctic coast and as far west as Bulun at the north of the Lena. An "All-Tungus congress of the Okhotsk Coast" proclaimed its autonomy under a Provisional Tungus National Government led by A.Ammosov. This was really inspired by the Yakuts who formed 65 per cent of the Tungus army. They were defeated by the Red Army, but still not entirely suppressed. In the District Soviet Committees in Yakutia, 75 per cent of the membership were Yakuts and in Yakutsk, 82 per cent were Yakut. The Committee for Assistance to the Peoples of the Outlying Districts of the North (the Committee of the North) had the aim of promoting the planned organization of the "small peoples of the North" in respect of economic, judicial-administrative and cultural- medical matters. The committee included sympathetic ethnographers like Waldemar Bogoraz, who saw the committee's task as helping the different ethnic groups maintain their own identity in the changes under the new Soviet regime. But as the Committee had no administrative powers, its influence was very limited. Ethnographic expeditions were sent out from Moscow and Leningrad to study the way of life of the different ethnic nationalities - not with the aim of preserving their culture, but to help in bring about change and conformity to a Russian way of life. One of the greatest benefits the Committee of the North brought was the establishment of "cultural bases" which provided the local population with services like a clinic, a vet, a shop and a school. Initially these were staffed by Russians. Some with pioneering or missionary ideals, but many became quite bitter at being dispatched a long way from friends and family to some unknown remote region with a dreadful climate. Educated local people were needed to continue the running of these places and take them over, and "Northern Departments" were opened for native students in colleges in Tomsk, Tobolsk, Irkutsk and Khabarovsk and other towns. The sale of alcohol in native territories was forbidden but they were to be exempt from state taxes and labour obligations. Consumer cooperatives were set up to counteract the private traders and land reform laws initially had the aim of dispossessing the rich and redistributing that land to the poor. Many socialists, such as Waldemar Bogoraz who had studied the Chukchi (who were not part of the USSR until 1928, and were being provided with rifles and other weapons by the Americans), thought the native peoples should be allowed to live their own lives but in reservations, as in the USA. Others were determined to bring the benefits of the new regime to all, together with modern culture, regardless of local opinion. Their attitude was the same as the Christian missionaries. They would force their own culture and beliefs on everyone. Meanwhile the first law courts under the Soviets were based on existing clan gatherings and in accordance with local customs. The Siberians were actually better off under the USSR than the Native Americans were in the USA. Despite the lack of freedom. Until 1974 they could not travel freely even internally within the USSR, and had little chance of travelling abroad. It is not equally realised how few rights Native Americans had on the reservations where they were not allowed to practise their traditional religion officially until 1974. During the Civil War, Yakutia had been cut off from supplies, and had suffered, as other parts of Siberia had, from severe famine and deprivation. The result had been a return to old values and customs, and to traditional beliefs. There was a revival of shamanism, with many new shamans. The aim under the new government under Lenin was first to organize famine relief and restore the Siberian economy. To this aim, traditional occupations had to be encouraged. Autonomous Republics and National Regions based on the ethnic population of the regions were created. Food and especially fish, was in demand for other parts of the Soviet Union, and so were furs - still the warmest clothing available for the Arctic, and also at that time, valuable for the export market. The next move were the "cultural bases" which operated rather like the Christian missions, but were political. Lenin, when dead, became a religious icon, he was even spoken of, by the Soviet "missionaries" in the same way to the locals, as the Christian missionaries had spoken of Jesus. They had to persuade locals to use their hospitals, and their shops (which could get supplied by plane, giving them an advantage), that was not too bad, but they also to attend very boring political meetings, and much worse and very hard for many people to accept, to send their children away to boarding schools. The brightest students could get to the Herzen Institute in Leningrad, and would then be returned (hopefully well indoctrinated with the beliefs as well as the benefits of the modern society in which they had been educated) to work amongst their own people again. Young women missionaries hoped to convince local women most of all of the benefits of the new system in providing them with better health care, better education, and improved standard of living and more freedom of choice. Against this was the prospect of sending their children away to school, and seeing them grow alienated from their family and cultural background. The shamans were central to the cultural and religious traditions, and because of this they were persecuted violently. The book called "Children of the Soviet Arctic" by Tikhon Semushkin, was one of many written by the "missionaries" of one of the cultural bases, and it is particularly startling, how the Russian people employed there, normally appearing friendly, tolerant and understanding of local (Chukchi) people and their customs, reacted against the local shaman, forcing his prosecution and execution. In this case the shaman was also attacked as the owner of one of the largest herds of reindeer and a major employer of labour in the region. This was also part of the government promoted prosecution of property owners, with the aim of collectivisation. This was eventually forced on everyone. The Tungus Committee was suppressed in August 1925 and Clan Soviets introduced. However the White Russian resistance - regarded as bandits to the Soviets were not sorted out complete for some years. In some districts the creation of Soviets was delayed until after 1928. The Institute of Peoples of the North was founded in Leningrad which became the centre of education for Siberian students, especially after 1948 when the Northern Department of the Herzen Pedagogical Institute was created. In 1925, the first group of 19 students from the Northern nationalities, were sent to study at Leningrad University. The aim was to produced native school teachers, so the new generation would be integrated into the Soviet system. In the 1920s Yakutia's only exportable resource was furs. The total value of fur bales in the Yakut ASSR in 1925-6 was over 3 million roubles. In 1927 it produced 30% of all furs in Siberia and 15% of the total Soviet export. The other exportable product was gold. In 1923 the new gold field discovered on the Aldan had led to a rush of labourers eager to exploit it. More than a third of these were Koreans or Chinese. As mentioned, more than a half were Russian. Little more than 3% of the workers at the new gold field were Yakut. By 1925, the Russian state organisations were gradually taking over at the gold fields. New machinery like steam dredges was brought in. But with great difficulty. Transport was a major problem, as no roads and railways had been built. In winter supplies for the Aldan gold fields had to be carried by pack horses, reindeer and even camels. In 1926 certain relics of the traditional "tribal" way of life were made crimes under a new law. Customs such as clan vengeance, blood-money, payment of bride price (kalym) and arranged marriages between minors. Although some of these were of benefit for the people, especially for the women, this was just part of the legislation made by the Russian government without the participation or consultation of the people involved. This was seen by them as part of the campaign to replaced a tribal way of life with the modern Western model, with action against the religion, particular the influential shamans, against a nomadic lifestyle, and against the traditional position of women, arranged marriages etc. It was not easy for the Russian Soviet government to push through measures against the traditional way of life of the Yakut people, because the number of Communist party members in Yakutia was very small, and they mostly Yakut themselves. In 1926 there were 820 Communist party members in Yakutia out of a population of 288,000. And most of these belonged to the Young Communist League. And most likely for social rather than political reasons, it was a good way to make friends and find love and marriage in the modern 20th century way. More than half -62.3% of the members of the Young Communist League in Yakutia were Yakut. More than 80% of the membership of Soviet Committee in Yakutia were Yakuts. There were National Districts for minorities: Even, Evenk, Yukaghir and Chukchi, but the Soviet Chairmen in these districts was usually a Yakut. Yakuts were still the largest ethnic group - 235,926 out of a total population of 285,471. Only 30,156 of the population was Russian. So Yakut was the main language of the whole region. There was a market for Yakut publishers of Yakut literature, such as the works of P. A. Sleptsov-Oyunskiy: The Red Shaman (Kyhyl Oyuun), The Bolshevik Songs (Yrya Khohoon). At the 4th Congress of the Soviets of Yakutia in 1926, many delegates were openly anti-Russian and opposed to Bolshevik policies. They believed they could obtain real autonomy from the Soviet Government. They particularly wanted to prevent Russians immigrating to Yakutia and thought Yakuts should have government positions acting as intermediaries between the Russian Soviet authorities and the local people. In 1926 came the Provisional Statute on the administration of the Natives of Outlying Regions of the north of the R.S.F.S.R. This established the election of "Clan Soviets" at traditional clan gathering places and a structure of regional native congresses and executive committees. In places where people were not part of a clan system the Soviets were based on the territorial region. Eventually all Soviets were to be based this way. More than seven years of being a battleground between the Russian Whites and Reds, had devastated parts of Yakutia. Some of the natives such as the Yukaghirs and Even (Lamut) had managed to survive by keeping to remote places out of the way of the political struggles. In less remote areas, they suffered because of the raiding of their herds. The Evenks and Evens of the Okhotsk region lost two thirds of their reindeer. The Kolyma Evens and Yakuts lost at least 80% and some people lost all their herds. In Verkhoyansk and in Bulun districts over 39,000 reindeer had been destroyed. There were anti-Soviet demonstrations starting first in central Yakut districts then spreading to the Northern districts of Anabar, Bulun and Ust-Yansk. The local communists formed militias to fight the rebels and succeeded in putting them down. 125 of the demonstrators had their property confiscated and 28,000 reindeer were distributed to the state collective farms. In 1927 Yakut nationalists under M. K. Artemyev, revived the Yakut Federalist (that is separatist) party. They called it the "Young Yakuts" and gathered support under the slogan "SOCIALISM WITHOUT COMMUNISTS". The Communists organised armed gangs to fight the Young Yakuts. By the beginning of 1928 the leaders were forced to surrender. The Central Committee of the Communist Party in Moscow reached the conclusion that the Yakut Provincial Committee had been too tolerant towards the national Yakut leaders and must in future maintain a more consistent policy of class conflict by cultivation the support of the rural poor. The Yakuts they felt had too much power. They must squeeze the wealthy and influential classes out of their positions of authority and deprive them of their lands and property. The most active nationalists were to be exiled from Yakutia. In an attempt to crush Yakut nationalism, the Sakha Omuk society was suppressed. The periodical Cholbon (Morning Star) was renamed "Kyhyl Yllyk" which means "Red Path" and it was placed under the control of the People's Commissariat of Enlightenment and Public Health. The nationalists deprived of their positions in 1928, were later dispatched to the slave labour camp on the White Sea Canal in 1931-3. As the Yakut ASSR was so large it had its own Committee for Aid to the Peoples of the Outlying Regions of the North. It was established to set up grain stores, distribute cattle, reindeer, guns, etc. to those in need and organise cooperatives. Also they were to improve the medical services and schools. Coal mines were developed and the drift mine at Sangar, near Yakutsk, started up in 1928. When I visited it in 1993, it was still in operation, as there are still coal seams left. Equipment and safety measures seemed little changed from 1928, and well below modern British standards including safety standards, for coal mines in 1993. The coal was used to provide electric power for Yakutsk and other towns. had remained independent of Russia. But tribute was extracted on the terms of "gifts to the poor white chief". They joined American traders in the North Pacific and especially from around 1889, on. Many Chukchi became rich and powerful in the region. English was their second language. English ships had docked there over winter since the "Plover" of 1848. Children were given English names like Robert and Elizabeth. The Russian Revolution had little effect until 1928. Brigades of Soviet "missionaries" arrived. The Americans provided the Chukchi with second-hand guns, including Winchester rifles left over from the Civil War, and encouraged them to resist the Soviets. But the missionaries, although critical and destructive of native culture were also bringing hospitals and schools. This was particularly attractive to the women who wanted to give birth in safe hygenic surroundings and have their children educated. Although they hated the thought of sending them away to boarding school. By the mid-l930s Chukotka (sometimes called Laurovetlan) became the Chukotka National District and then later an Autonomous Soviet Socialist Republic. After 1991, it became a Republic under the Russian Federation. For a time, its President was Roman Abramovitch a billionaire who owned Chelsea football club. Chukotka and Chelsea. More. more. More about Chukotka. 19th century Chukotka and its traditional astronomy. More on this. Gold was the major export from the Aldan gold field. There were 38,000 gold miners at Aldan. That was 11% of the whole population of Yakutia. Many of these were not Yakuts but Korean and Chinese. All the officials, engineers and most of the workers were Russian or from other European parts of the USSR. Employment problems resulted in the recruitment of about 1,000 Yakut labourers. In the 1920s gold mining was developed by the state company Dalzoloto "Far Eastern Gold". Gold and platinum were discovered by the river Kolyma and the river Indigirka. The gold field of Srednetian was opened up with about 4,000 miners. Most of the miners were prisoners forced to work here as slave labour with only primitive tools and equipment and no mechanical aids. In December 1931, the "State Trust for the Development of Industry and Roads in the Upper Kolyma Region" was founded - the Kolyma Trust. It was given a territory of over 190,000 square miles - bigger than California and cutting into the borders of the Yakut ASSR and the Okhotsk-Even National District. Its administration was subordinated directly to the Communist Party. Direction of the Kolyma territory was under Latvian Bolshevik, Eduard Berzin, who had been a military commander in Moscow and industrial organiser in the Urals. In 1933, Magadan was built with forced slave labour on the Pacific coast as an administrative centre. Boats crammed with prisoners intended as slave labour, were unloaded here. During the first six years Berzin was able to keep the project well organised and conditions for convict labourers relatively decent. 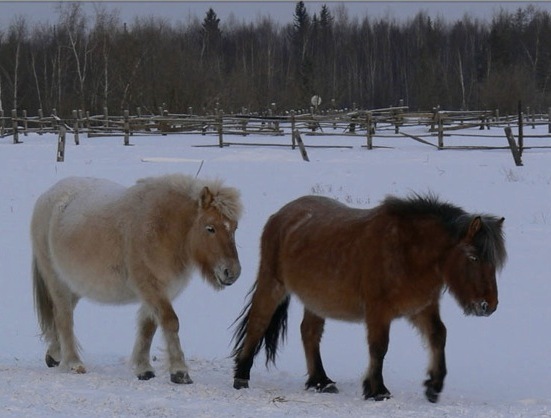 The local Evens were forced to provide food and reindeer transport for the Kolyma Trust. Many of them tried to escape this, by keeping far away in the remote countryside. The local Committee of the North was taken over by the Kolyma Trust. A few local people did benefit by having work on collective farms and from the schools, which were staffed by local teachers. In 1934 A Union of Writers of Yakutia was created. Among the Yakut writers were Platon Oyunskiy, S. Yefremov, Erilik Eristin, A. Ivonov-Konde and N. Mordinov. In 1935, The Institute for the Study of the Language, Literature and History of the Yakut ASSR was founded. There were twelve newspapers and a magazine in the Yakut language. In 1937, over three quarters of the schools in Yakutia, taught their pupils in the Yakut language. There was a teacher-training institute and text books were published. In 1938, the Soviet government insisted on the compulsory study of the Russian language in non-Russian schools. In 1939 the Yakut alphabet was changed from one based on the Roman alphabet as used for Turkish, to a Cyrillic version. This was slightly different and modernised from the Cyrillic alphabet used for Yakut before the Revolution. Money had been little use in the Okhotsk/Kamchatka/Chukchi territories. Until the 1930s all goods were bartered for furs or gold - or vodka. Hunting and fur was still the main economy and as a result animals like sable were by now almost extinct. Fur coats were fashion status symbols in the world of the 1930s. Official agencies were created to control trade - such as the Okhotsk-Kamchatka Joint-Stock Fisheries company (OKARO) and the Far East State Trading Company (Dalgostorg). From 1924-29 furs were 10-15.3% of the total Soviet exports so this region was very important to Soviet economy. During the 1920s the USSR government created a network of trading posts for hunters to deliver furs regularly, organised as co-operatives. The co-operatives delivered the furs to state procurement agencies which issued money credits enabling them to buy goods in state stores. These supplied the goods it was felt that were necessary, flour, salt, sugar, tools and raw materials needed for building etc. Credits were also provided to purchase weapons, ammunition and other necessary equipment. An accusation against the pre-revolutionary private traders was that they mainly supplied vodka and trashy trinkets, and not the basic commodities. The state stores were not that brilliant at providing anything though. Before 1931, Yakuts were 82.6% of the total population of Yakutia, which in 1926 was 235,926 out of 285,471. Russians were only 10.6% and most of these Russians were illiterate peasants. So the Russian government had to depend on Yakuts in governing the country and subordinating ethnic minorities to the Soviet system. The Yakut Republic in 1931 was as big as the whole Indian subcontinent. It was 750 miles from Yakutsk to the boundary of Transbailkalia in the south-west. It was 990 miles to the Taimyr in the north west. It was 500 miles to the mountains by Okhotsk on the Pacific Coast. And it was more than 1,200 miles to the furthest point on the river Anadyr in the north east. But in 1931, Yakutia was reduced in size by one third, especially in the north east. This still left it the largest of all the non-Russian administrative units, and bigger that the Ukraine, at 1,200,000 square miles. Part of the area in the east went to the Chukchi and Koryak National Regions, as mostly these nationalities lived there. But the upper part of the Kolyma river was transferred to the Okhotsk-Even National Region, not just to put the Evens together but in transferring it from Yakutia to the Far Eastern Region of the Russian Republic, they also transferred the gold which had been discovered in the Upper Kolyma Region in 1927. In 1931 a new Soviet industrial trust called "Dalstroy" was founded to exploit the gold and other minerals of North East Siberia under the direct rule of Moscow. The rights of minorities in Yakutia were reorganized. in the Yakut ASSR, national Districts were founded for Evens (6,526 in nine districts), Evenks (5,772 in five national districts, Yukaghirs (only 321 left) and Chukchi (351 in Yakutia). But in most of these national districts the Soviet Chairman was Yakut. In 1933 Yakuts represented nearly half (46.7% of the membership of the Yakut Communist party). About 3 per cent of the remainder were Evenks, and the rest were Russian. Despite this, there was resistance to the policy of collectivisation, except from the poorest members of society who had nothing anyway to lose and a home and work to gain. People were organised by the party into committees. Soviet agents classified the locals into "poor", "middling" and "kulak" classes. A Kulak could be anyone with some land and property - not necessarily wealthy at all. "Kulaks" were expelled from local soviets and their property forcibly confiscated. This naturally led to angry scenes at meeting and violence. Russian officials were killed. Arson, sabotage and the slaughter of herds rather than let them be taken into Russian hands, thwarted Russian government plans. One of the families who had all their livestock killed, their fields dug up and were deported from Russia to Siberia in cattle trucks from 1929, were the Kalashnikov's. In 1930 it was their turn - parents and children, including one that became world famous later, were deported to Nizhne-Mokhovaya. It was not until 1934 that the deportees regained their citizen's rights. In 1938, Mikhael Kashnikov was called up to the Soviet Army and began to design guns, in 1949 the iconic AK-47 was approved for production. There was less passive reception of the treatment of farmers and herders in Siberia. In Kangalassy the collective form chairman and manager were killed and the deputy chairman of the local soviet was wounded. This was retaliation for the brutal actions of over-zealous communist activists such as at Ust-Aldan where a fanatical gang organised by the local communist party destroyed all the Yakut houses because they wanted to put all the members of the new commune into one large hostel. Collectives were rarely successful. They were forced to waste money and labour on futile attempt to establish European methods of agriculture north of the Arctic Circle at places like Zhigansk and Verkhoyansk, and to meet unrealistic production targets set by Moscow planners. Reindeer herders in the northern and upland regions of Yakutia resisted collectivisation. The population was 54% Yakut, 39% Tungus, 2% Yukaghir and 4.5% Chukchi. The development of Russian industry in the north meant a demand for reindeer for transporting freight and this was an additional heavy burden on the local population. By 1937, only 19% of reindeer herds were collectivised and most people still carried on with their traditional nomadic life style. In 1937, the main export of Yakutia was still fur. There were about 20,000 hunters who each year killed about one and a half million squirrels, 250,000 ermines and 35,000 arctic foxes. This was worth 16 million roubles to the USSR in foreign trade. They were fortunate that during the 1930s, a fur coat was the height of international fashion for wealthy women and to own a fur coat was an aspiration for others. No woman with claims to wealth or celebrity was seen outdoors without her mink or similar expensive fur coat. It was part of the package along with the limousine and the diamonds. Ordinary women aspired at least to a fur scarf or stole. For Yakut women fur coats continued as essential everyday wear. Winter fur coats and spring fur coats. Despite this trade, much of the country was still remote from roads and towns, which made it easier for nomadic local people to keep in the most remote regions, living a traditional but poor and difficult lifestyle as hunter-gatherers and trying to avoid any Russian authorities who were trying to destroy their culture and their religion. Shamans were persecuted, hounded down and often murdered by the Russian authorities. Anthropologists were sent out to collect data on customs and religion and shamanism, and were expected to present their reports in the correct idealistic manner. Their reports always had a long and very boring preamble salted with quotes from Marx and Engel (neither of whom had anything to do with native Siberians and probaly knew nothing about them) and in slagging off rival or previous workers in that field. The local ethnic life style and culture had to be presented as belonging to a primitive state and the shaman as a "kulak" and the leader of unrest and anti-Russian activities. At the same time the the entropolissts and ethnographers were preserving the traditions, customs, folklore, songs and poems of the local people which was to become a valuable resource later when they wanted to reconstruct their traditions. And the ideals of Siberia shamanism spread to Europe and the USA. But in the 1930s, shamans were viewed by as leading their people against a modern way of life and access to modern medicine. Although in reality the modern medicine that was accessible to most people at this time was not always better than the traditional folk medicine. In 1938, the gold mining in Kolyma which depended on forced convict labour, under "Dalstroy" was taken over by the NKVD. In 1939, responsibility for geological exploration was transferred from Glavsevmorputi to Dalstroy. This meant that Chukotka was now also ruled by the NKVD. Tin was found near Pevek and mining began there in 1940. This led to the reorganisation of the Chuckchi reindeer herds to provide food for the new region. In 1943 a state reindeer farm was set up near Pevek. Russia's Far East had been under threat from Japan since the Russian defeat early in the century. In the 1930s, the Japanese occupied Manchuria. Regardless of the horrors in China and elsewhere, this was an oriental great power showing equality or superioty to the European powers, and there was a lot of pro-Japanese feeling amongst the oriental people in the Far East. There was a pro-Japanese rising in Mongolia. Stalin increased military forces in the Soviet Far East and also the power and presence of the dreaded NKVD. Vast numbers of people, civilians and military, were accused of being Japanese spies and executed or sent to the state slave labour camps - the Gulags. The terrible racist attitudes seen in Europe were also amongst the Ukrainian and Russians in Siberia, and led to mass genocide here too. About 63,000 Chinese living in the Soviet Far East suddenly disappeared. They were wiped off all the records. Koreans were deported to Kazakhstan as were Poles. At the same time, Stalin founded the Jewish Autonomous Province in the Far East. This was intended to counter the Zionist movement (led by such influential people as Albert Einstein and Chaim Weitzman) to found a Jewish state in Palestine. The official language was to be Yiddish. As a result, although few Jewish people actually live there - (and only those of East European origin once used Yiddish as their lingua franca), it has one of the most important Yiddish library archives in the world. The region was Birobidzan - the region settled by the Yakuts and Tungus who had fled Russian rule in the 17th century and appealed to the Manchu Emperor of China for help against the Russians. As an alternative to Palestine - the traditional Jewish homeland, Birobidzan had nothing to attract Jewish settlers unless they were forced to go there. In 1939 only about a fifth of its inhabitants were Jewish and at the same time, they were not allowed to practise their religion. At Dalstroy, Berzin from 1937 came under increased pressure from Stalin and the NKVD to keep up production of gold, tin and other metals at all costs. The gold was needed to buy technical equipment and machinery from countries like Germany. More and more boat loads of convicts and exiles were shipped to Magadan to be sent to what had now become concentration camps where inmates suffered and died in droves. There are always people with a grudge who take advantage of such situations. Boatloads of scientists and other academics arrived in Magadan for the Kolyma gulags. Amongst them several members of the rocket research programme GIRD, - which meant that the rival to the German rocket programme was set back. It is thought this might have came about though German intelligence, unsuspected by Stalin's government which thought it had bought time from conflict with Hitler. One of these rocket scientist prisoners was Sergei Korolyov, apparently denounced by colleague Valentin Grushko (who still became a prisoner as well). Many other scientists and engineers were arrested on trumped up charges and a number of the most important were executed. After five months, Korolyov was freed and made his way home across Siberia with some difficulty and no help except from kind strangers. He had scurvy and lost his teeth. Korolyov and other surviving scientists, engineers, and other professionals were placed in factory prisons called sharaska - here they worked hard during the war to make up for the terribles mistakes Stalin had made earlier by destroying citizens with ability and talent. Berzin's efforts to stay on the right side of Stalin whatever the cost to him of his moral conscience or standards were pointless as in 1939 he was shot. Then his successor Garanin was shot. Dalstroy was put directly under the control of the Communist Party and the NKVD. Thousands of prisoners were sent to the death camps. One was named Elgin and one was named Bukit after the Yakut and Evenk names for hell. They worked in the mines and on the associated superstructure, the towns and the road (still mostly only a rough track) which links Yakutsk to Magadan. The abolition of the Committee of the North in 1936, meant that the Siberian native people were no longer treated differently from other people in the USSR. They were no longer exempt from military conscription. In 1937 all ethnic army units were abolished in Stalin's military purge. This meant all conscripts would be treated the same and had to use the Russian language. A law of 1939 also extended conscription for military service to every male citizen of the USSR. With the Germans besieging Moscow and Leningrad, mass mobilization took place and only certain categories of workers and students could be exempted. The skills of Siberian conscripts were put to use as skiers, snipers and scouts. Many lost their lives. In Yakutia, out of 40 Evenks conscripted, 22 were killed in the war. It was the Siberian troops who saved Moscow. Unseen and silent in the snow they picked off German soldiers shivering in their smart but unpractical uniforms and terrified them. It was the turning point of the war in 1943. 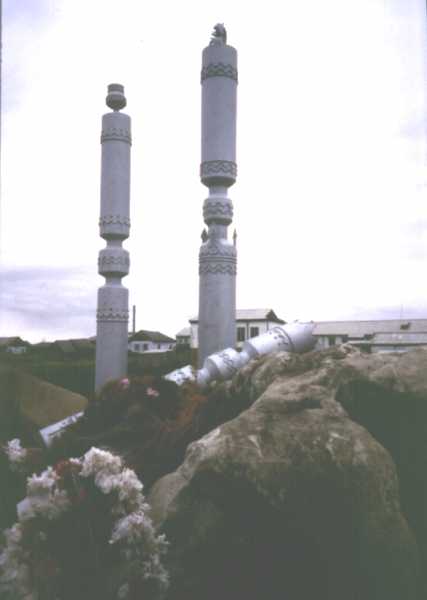 The picture shows the war memorial in Kyusyur which is in the form of concrete horses hitching posts - horses hitching posts being the traditional Sakha religious memorial - one is symbolically broken. The survivors who returned home, had been brought into contact with the outside world. They had met foreigners, learnt Russian, acquired a taste for a modern way of life. They returned to impoverished homes. The women were left with the burden of doing all the work by themselves and yet were still being forced to fulfil the state quotas for production. If they failed to meet these quotas set by Moscow, for farming, hunting and fishing, they were not paid, and were also financially penalized. As a result they suffered terribly and children were left without adequate food, clothing and care. In Yakutia there was a drought from 1939-1942. Cattle had to be taken long distances in search of pasture. There was a massive drop in the crops produced and the number of cattle. Some farmers lost all their own cattle and so their independence. Reindeer herds were depleted by more than half. Rivers and coasts were over-fished. These shortages continued for many years after the war. From 1945 to 1989, there were four Presidents of the Yakut ASSR - all were women. This reflected the situation in the general population - women were in the majority and did most of the work. With the hasty American occupation of Japan after the war to keep out the USSR there was increase pressure to keep the borders. The Soviet Union had massive borders to control after the war and the pressure of the Cold War to keep up defence measures it could not afford. In Asia there was the border with China, the Pacific and in the north Alaska and Canada across the Arctic Ocean. Radar and air traffic meant increased industrial and military presence. Whole areas were forbidden zones and the population was under strict control and lack of freedom. Until 1989 it was impossible to visit Yakutsk as a tourist, and you could only go to places served by Intourist. And then you were accompanied by a guide or interpreter the whole time. At least as I found, you did not have to worry about your safety as a woman travelling alone as you were always watched. Stalin's death in 1953, came as a relief to everyone including his own surviving family. Krushchev denounced Stalin, prisoners in the death camps were rehabilitated, and the first satellite, Sputnik was launched into space in 1957 heralding a new space age. And the ability of the USSR to launch things into orbit around the Earth before the USA was anywhere near doing that. Also in 1957 Dalstroy was abolished. Dalstroy's territory had been increased until it covered all of North East Siberia, some 926,640 square miles. In 1951, Yakut historian Georgiy Basharin had been in trouble for supporting writers A. Kulakovskiy and A. Sofronov, who had been suppressed in the 1920s. After 1956, when Krushchev denounced Stalin, many of the Yakut political figures who had been arrested and killed in the 1930s were rehabilitated. These included Platon Oyunskiy, S. Golgolev and M. Ammosov. The traditional way of life seemed to be disappearing. People either took new jobs or retreated into the countryside. The balance of the populations changed as more workers were brought in from other parts of the Soviet Union, so that by the 1970s the Yakuts had gone from half the population to one third. In the 1950s the previous smaller collectives were amalgamated to form larger units and then the larger units were made into state farms. This caused a lot of trouble and violence with the slaughter of herds. Nomadic hunters and reinder herders were forced to move to the new farm centres. This caused great misery and anger, as people were taken from their homes and moved into small towns and villages with few amenities as compensation. Evenk nomads were made to live in wooden houses in villages and small towns and the women and children were left there while the men went hunting, fishing or herding reindeer for months and months away from home. So the traditional way of life for the Evenk had almost disappeared by 1990 - only to be revived in the early 1990s when they were faced with survival without the support of the state. In 1957, there was a government publication "On measures for further development of the economy and culture of the peoples of the North". These plans for reforms and their sequel in 1980 were never carried out. By the time collectivisation into state farms was complete, this way of life was nearly over, the country was changing. Between 1955 to 1974 there was a massive attempt to provide electricity for Siberia. It was needed for the industries, for the defences, and so people also had it in their homes. They may not have much in the way of water supply and sanitation in their home but they did have electricity and television which was also available as battery powered portables for hunter's tents - thanks to the Molynia satellites in their special eccentric orbits. Television was to make an enormous differerence to the life of people who had been so isolated from events in the rest of the world. The hydro-electric power stations like Bratsk, meant valleys were flooded and rivers altered. There were also massive dams on the Yenisey, Zeya and Vilui. They were proud of these power stations and waterworks. 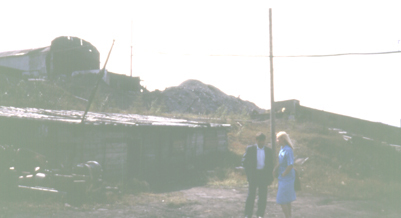 When I arrived in Bratsk in 1983, my guide who was Mari (Cheremis) origin as were lots of people there - exported from their homeland, - introduced herself and said "Of course you will want to see our power station." "No" I said. "What! you do not want to see our power station - it is the biggest in the world." "No it isn't" Then as she argued - about this I pointed out that I did not care if it was the biggest or the smallest it was just as boring. I did not come all this way half-way round the world to see a power station - we had them at home. "What have you come here for then" - "The prehistoric rock drawings" I ventured. "They were drowned in the lake when they built the power station and dam." "The museum" (I was guessing here - all towns have a museum) "The museum is shut". So I told her that I had come especially to see the ancient history, and the traditional way of life etc etc - all the things in fact that tourists would normally want to see - however I made it into an academic expedition. "As you are a scientist I shall speak to the Director of the Museum". So the next day I did get to be escorted around the little museum, and then around the "Evenk Zone". I made friends with the guide by showing her family photos when she saw one of my husband she looked sympathic and said her husband was a rough man too. But I was told that as I was the only foreigner (the East Germans and Chinese it seemed did not count - nor the other guests) the restaurant was shut. There did seem cheerful noise from the bar but I was not allowed to go there. Bratsk looked like Stevenage in the centre, but the sanitation was dreadful. The hotel ensuite was just copper pipes and cracked tiles and floor level loo - with thick hard brown loo paper. The Buriat Mongol man in the next room joined me at dinner the next night only to be forcably removed by the waiters - as that part of restaurant for foreigners only - there did seem to be parties of European Russians there though - it was very embarrassing to me and showed me how racist it could be in Siberia - confirmed on later trips. Apart from hydroelectric power (you can see a big dam of the Yenesei from the plane when you fly over Siberia from Beijing). Oil and gas reserves were discovered. Iron, coal, copper and nickel. It was not until the 1970's that alarm was being shown by ecologists at the effects of the pollution of these industries, on the sensitive permafrost environment, and on people's health. Around the nuclear power station at Bilibino, used mainly for atomic bombs, was the highest rate of oesophagal cancer in the world. The disease is not uncommon at nuclear power stations anywhere. Workers get plutonium in their sandwiches. Construction continued on the still unfinished BAM railway started in the 1930s which goes through southern Yakutia, through Evenk territory. I saw the bit going to Ulan-Ude. The connection to Yakutsk and then eastward to Okhotsk which had been planned when the original trans-Siberian railway was built, had been abandoned when the Russo-Japanese war gave priority to the route further south to the Pacific, and is still unfinished. So there is still no railway in most of Yakutia. 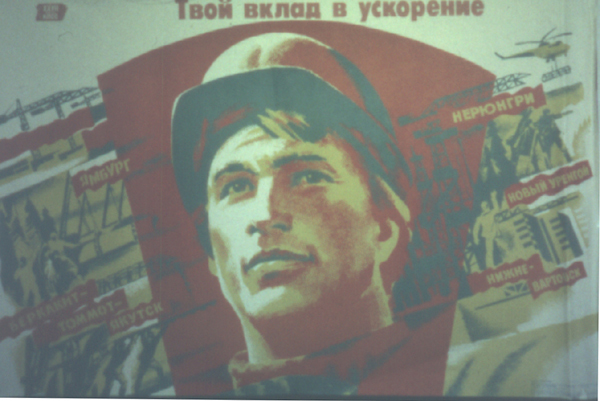 Although the south of Yakutia was designated as a special economic area as i"n this c.1980 poster. By the time the Cossacks had reached the Vilyuy, winter was approaching and the rivers freezing solid. The Cossacks built a wooden fortress for their winter quarters by the Vilyuy, near a small stream called the Malaya Bortusbuya. From here, when the ice melted next spring they set off further down the Vilyuy to the River Lena and the Sakha capital of Sakhsary. Although the Russians knew the Sakha/Yakuts found diamonds occasionally in the gravel banks of the River Vilyuy, concentrated exploration along the river and its tributaries failed to uncover the source of the gems. In the 1930s Vladimir Sobolev, a graduate of the Leniningrad Mining Institute, studied everything he could about the diamond bearing region in South Africa. He was convinced that the geology corresponded with that to be found in Central Siberia between the Lena and the Yenissey. In 1941, he presented a report to GOSPLAN in Moscow, in which he concluded "The Central Siberian geological platform is to all intents and purposes identical with the South African diamond bearing region. Here if anywhere, we will find diamonds. I particularly direct attention to the valley of the Vilyuy River and recommend that detailed prospecting be started there at once." With the entry of the USSR into World War II, that report was shelved. A young geologist Gregory Finstein remembered it. On August 12th 1949, he collected six diamonds on the banks of the Vilyuy. Soon he had collected several handfuls of these gems. However the source remained unknown until 1952. Two young women geologists Natalia Sarsadskikh and Larissa Popugaeva, from Leningrad, had been examining river sands from the Vilyuy. They discovered tiny red garnets of the type known as pyropes. Natalia had been reading an old science fiction magazine published in 1944, which had a story called "The Diamond Pipe" which was a fictional tale of the discovered of Siberia's first diamond mine. In this was described the pyrope which are often found together with diamonds. Pyropes occur in the same kimberlite type rocks which formed in ancient volcanic eruptions. Larissa and Natalia took a closer look at their samples. In some the pyrops were larger. Larisssa thought that since the pyropes were much less hard and durable than diamonds, they could be easily eroded by the action of sand and water. So the further they had to travel, the smaller they would become. In 1953, twenty-two year old Nikolai Babkov decided to test Larissa's theory. He arrived at the Vilyuy just as the ice was breaking on the river and it was in full spring flood. He followed the pyrope trail in the sands, in a small boat. He noted in his journal that the pyropes appeared larger as he came nearer to the valley of the Malaya Bortuobuya - the site of one of the earliest of the Cossack fortresses. But two days later, his boat overturned in the rapids which the Evenk name meant "Big Blood Falls" and he drowned. Babkov's notebook was recovered, and the following summer Larissa Popugaeva led a group of geologists to prospect the region. She insisted on following her own trail of the increasing larger dark red garnets in the river sands, until they disappeared. They searched around that spot and discovered a kimberlite diamond pipe they called "Dawn". It was not a very major find but encouraging. Next summer, in 1955, another geologist, following the trail described by Bobkov in his journal, found a pipe of diamond laden kimberlite that was to become the giant Mirny diamond mine. More kimberlite pipes were found soon after and the Russian mines and mining towns developed without regard to the environment and pollution of the Taiga. This region is now the second largest diamond producing region in the world. Some huge diamonds have been found. In 1980 a 341.5 carat diamond was called "The 26th Congress of the CPSU Communist Party of the Soviet Union". A diamond was named after Princess Diana following her death in 1997.
article on the diamond mines. List of mines - different sorts - in Yakutia. Forest fires are very common in Eastern Siberia. They can be seen caused by lightning striking the trees in a storm - you can see columns of smoke going up in the taiga. Fires are also thought to be caused by the spontaneous combustion of methane escaping from underground oil. Those fires and the traces of old forest fires in Yakutia can be detected by satellite photos. New sources of oil and gas have been discovered on the sites of fires. Another method of detection which was used in Viluy was the Iskatel-3 device which can detect one molecule of methane from ten million molecules of anything else. It is a laser device that uses the properties of molecules of different substances to absorb light at various wavelengths to detect gas escaping from the ground. It can be moved over the ground up to fifteen kilometres an hour. The Cosmophysical Research and Aeronomy Institute of Yakutsk claim that the Northern Lightes can show hydrocarbons. They say that the location and brilliance of the lights are influenced by the Earth's magnetic field and this can help indicate the presence of oil. When oil is found the next problem in Yakutia is the permafrost which makes drilling even with diamond bits harder. Amongst new ideas to help drill through permafrost is using very hot gas which can cut through twenty metres with each blast. It doesn't just melt the ice but the rock, so when the rock cools it forms it own casing. A four-hundred pipeline from Mastakh supplies gas to Yakutsk. It is interrupted in cold weather just when it is most needed because water comes up the wells and freezes between the well head and gas treatment planet. Despite antifreeze and methanol. In October 1983, it was decided to build an 83 kilometre extension to the pipeline west to Sredny-Vilyuy. But the Lena River Steamship Fleet failed to bring thirty kilometres of pipe on time. So the commissioning of Sredny-Vilyuy was delayed until November 1986. although plans to do it dated from 1981. Meanwhile in 1984 to 1985, there were numerous interruption to the gas supply in Yakutsk in what was a very cold winter. Sredny Viluy is the biggest Yakut gas deposit found so far and could supply gas to power the turbines of central Yakutia until well into the 21st century. It was hoped to supply gas to Japan, but Japan was not interested at that time. The full development of oil and gas reserves had just began with the investment of other countries. But having developed the facilities, the Russian government in the 21st century then seemed to be forcing a take-over. The Republic of Sakha (Yakutia) was entirely dependent on outside sources of fuel, although it still has large undeveloped oil reserves. This dependence gives the Russian Federation great economic power over Sakha. Because of various factors, including high transportation costs, some areas in Sakha were paying two or three times the world market price. Sakha Oil and Gas Company, is in great need of adapting its oil and gas industry to market conditions. 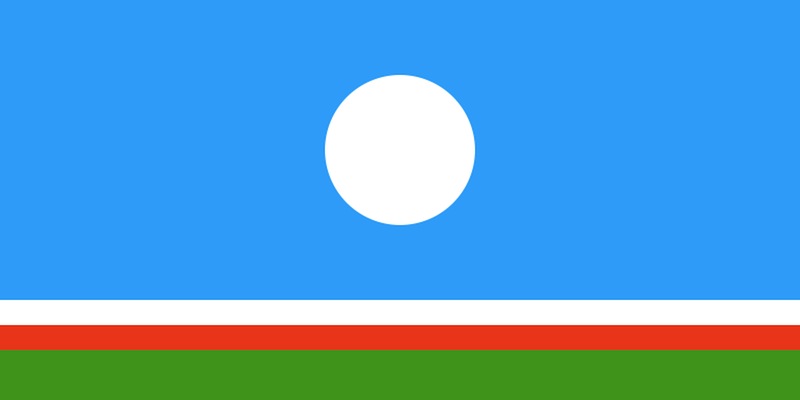 The winning design for the new flag of Sakha Sirey, the new Sakha Republic in 1991, was by Ludmilla Sleptsova and her daughter Anna, both were artists, Anna was still an art student at the time. The design represents the midnight sun, the ice on the rivers, the land and the trees and meadows. 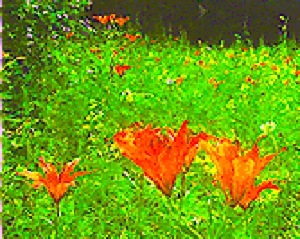 The national flower is the Sardana - a sort of red lily that comes out in early summer. 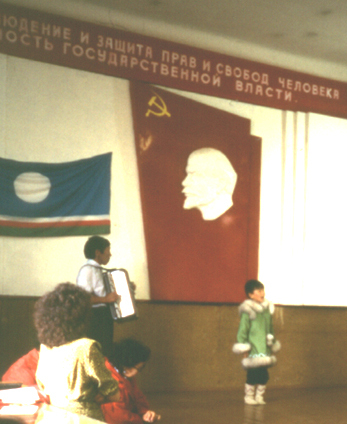 Entertainment by the children in the school hall Zhigansk 1993, Kolya is singing an Evenk song. He was age 11 then and spoke good English. This was very impressive compared to the level of languages at that age in England. 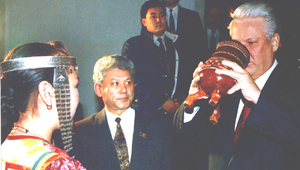 The President of the new Sakha Republic elected on December 1991, was Mikhail Efimovich Nikolaev. Born in 1937. Married with three children. Originally trained as a vet, by 1989, he was Chairman of the Presidium of the Supreme Soviet of the Yakut Autonomous Socialistic Republic. Re-elected after five years he remained President until the elections of 2002. He was noted for his dispute with Yeltsin over the control of the Alrosa diamond company. Yeltsin made an effort to overcome resistance. Dressed in traditional clothes he danced traditional dances. 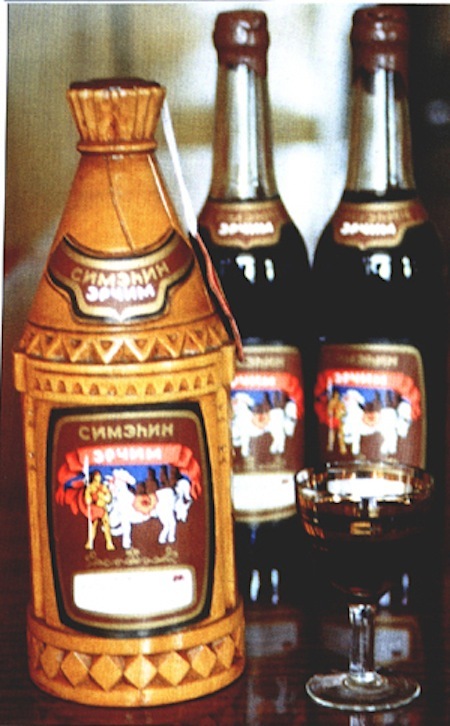 And drank lots of Yakutian vodka (which has a picture of a legendary sort of hero on the label) from large carved wood traditional choron with little legs carved like horses legs. Sakha people were now allowed to travel abroad freely for holidays, studying etc. Under the USSR they would not have been able to obtain passports, even internal travel was restricted. Now they could go on holiday to anywhere they wanted- as long as they could afford it. Yakut students got places in overseas universities. At that time the Scott Polar Research Institute was still interested in Siberia and Northern People. A friend of ours was there, mid 1990s. We went to see her give a lecture. I was approached by the Director then Terence Armstrong: "How did you come to know our little Yakut." he said. I told him I was friends with her professor at Yakutsk university. "How did you come to know a professor at Yakutsk university" he said. I was astonished and appalled at his attitude - but anyway the SPRI, (currently at the time of writing), concentrates under the subsequent director on the south pole especially Shackleton). Before the 1917 Revolution many Yakuts had been traders in China and Alaska. In the Stalin era many of them had been cut off from their relatives. Now contacts were made again. Clothes and other things came into markets in Yakutsk and other places from Alaska and China. Yeltsin awarded to the Chinese the rights to purchase small uncut diamonds in Yakutia. As the China changed in the mid-1990s so more Chinese came to live in Yakutia. In 1991-92, Nikolayev had managed to get from Yeltsin many concessions to income sharing and taxes from Yakutia's diamond industry (the local economy's backbone), gold mining and other industries. By the late 1990s, all the regions surrounding Yakutia had been devastated, as a result of Moscow's policies. In Chukotka the population fell by over 50 percent, and in Magadan region (bordering the Sea of Okhotsk) by over 40 percent. By 2002, the population of many of the towns had reduced so much since 1989, the place was no longer viable to live in. Services and industry has been reduced or in some places disappeared so people can no longer live there. Moscow's plans, failed in Yakutia, whose population fell by 5 percent. President Nikolayev managed to amass substantial funds and used them to develop the local economy and provide for the public welfare. Moreover, Nikolayev did his best to establish wide-ranging economic and political ties with Tokyo and Washington. Japanese companies by 1995 had compiled a detailed project for the development of Yakutia's natural gas basins and construction of a gas pipeline to Japan, via the Sea of Okhotsk and Sakhalin Island. This was a good project, but it was terminated in 1996 because of Moscow's interference. Simultaneously, Moscow tried to take back all the economic-financial privileges earlier provided to Yakutia. The real war unlike that in Chechnya in that it was not fought with weapons, between Moscow and Yakutsk took place in 1996-97. Moscow didn't make many gains and had to retreat. After the formation of the Sakha Republic in 1991, the Sakha religion was made the state religion to be taught in schools. At this time there was about four black shamans and very many white shamans. A shaman's conference was held in 1992, in Yakutsk. During the 1980s there had been an increased interest in folklore and traditions and national identity and there had been student riots in Yakutsk. Now books were published on folk tales, shaman stories and the shamans were established - new younger shamans. The traditional beliefs do fit in very well with post 1990s beliefs and ideology worldwide. Also in Yakutsk there were already many Jewish people, and Russian Orthodox. But a new malignant force moved in. In 1993 I noticed coachloads of American missionaries from the so called Christian cults - eager to knock on new doors. These cults have caused a great deal of distress. Young women have disappeared, last heard of thinking they were going to better paid jobs in London, Paris, Amsterdam etc. There has been murder and child abuse especially from so called Pentecostals. Even when abroad people from the Russian Federation are targeted by the cults. We were even hassled ourselves in Cambridge, taken for Russians. 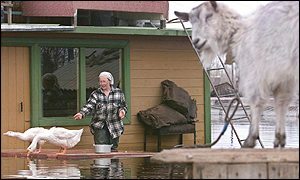 The devastating spring floods (caused by global warming melting the permafrost) in the mid 1990s on, showed a continual inaffectualness of the Yakutian government to improve living conditions in Yakutsk. Letters sent to me from friends in the mid 1990s tell of having no central heating - although it was very cold (coldest winters in the world), and their income was not enough for food and other things. They were finding it very difficult. Parcels sent to friends were not always received by them. In the 2002 elections the Vice President, Vyacheslav Shtyrov won and became President. Born 1953. A construction site foreman, he eventually became the Minister for Construction and Investment of the Sakha Republic (Yakutia) and in 1991 Vice-President of Yakutia. For three years he was also the republic's Prime Minister. In August 1995 he became the President of the joint-stock company ALROSA. His election was supported by Vladimir Putin. Exploiting the rich natural resources of Sakha Republic does not always benefit the local people. Horses, and how to cook them. Countries surrounding the North Pole, each want to claim their own territory. Now that technology means the resources are accessible. More later. Here is a link to some information about this. Sakha Open World - for the Sakha Diaspora - Sakha ex-pats - also has ethnic music and other things. Also Irina did interview with me. "Yakutian-Sakha Informational Agency" a news website. Updates on Yakutia.